At St Michael's we believe that a high-quality music education should engage and inspire pupils to develop a love of music and their talent as musicians. 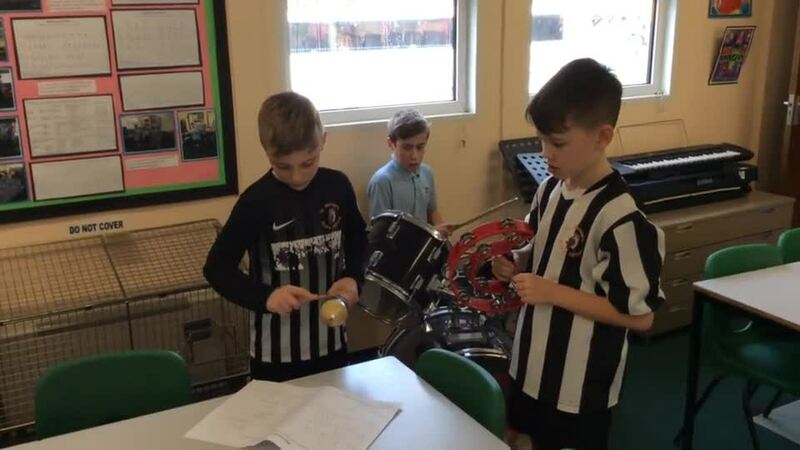 Through our music provision children will increase their self-confidence, creativity and sense of achievement. Children enjoy exploring and creating music together and have regular opportunities to do this on their journey from Reception to Year 6. They build on their own skills and are given opportunities to progress at their own level. Children who learn an instrument are encouraged to bring them to curriculum lessons for composing and performing sessions. Year 6 composition inspired by the 12 Bar Blues. 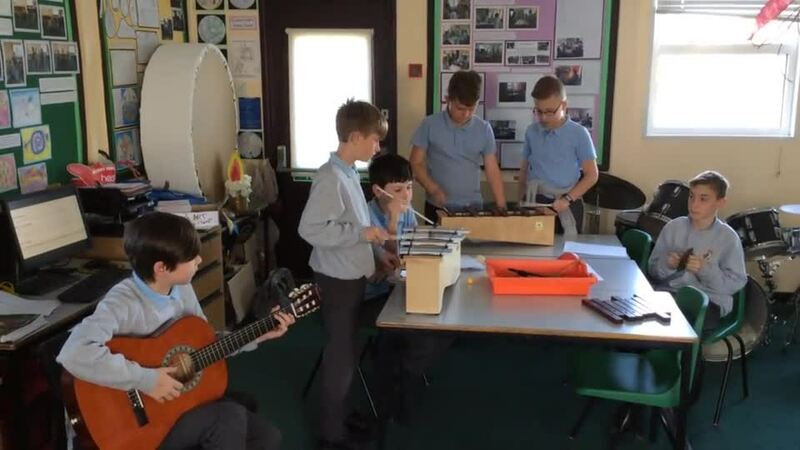 They used their understanding of the musical elements - structure, pulse, texture, tempo, chords and melody. They then used their knowledge to compose a 12 Bar Blues piece using Garageband on the IPads. Mrs Murray is the Curriculum Enrichment and Music Leader throughout the school. Curriculum music is linked to topics. In both the Foundation Stage and Key Stage 1, music is linked to topics and is taught by the class teachers using Charanga. 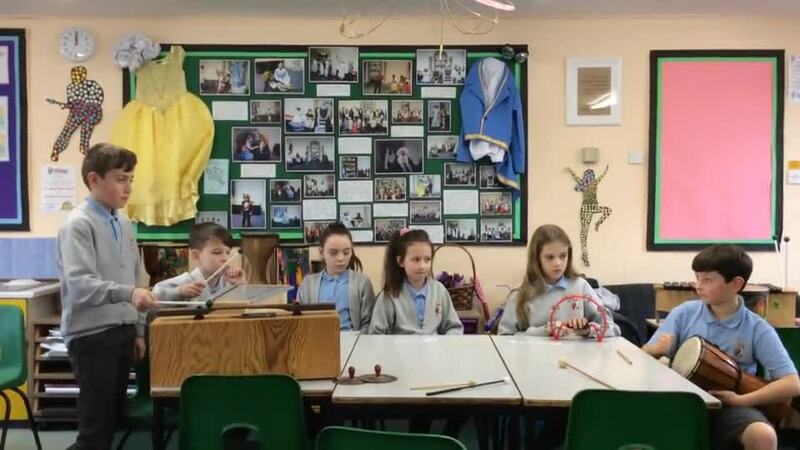 In Key Stage 2, it is taught in the Music Room by Mrs Murray. perform, listen to, review and evaluate music across a range of historical periods, genres, styles and traditions, including works of the great composers and musicians. learn to sing and to use their voices, to create and compose music on their own and with others, have the opportunity to learn a musical instrument, use technology appropriately and have the opportunity to make good progress. understand and explore how music is created, produced and communicated, including through the elements: pitch, duration, dynamics, tempo, timbre, texture, structure and appropriate musical notation. In Year 3 we have enjoyed learning about junk bands. We listened to bands like Weapons of Sound and discussed their music. We explored our own junk percussion and discussed the different timbres. We learned about pulse and rhythm. We practised performing different rhythms by reading graphic notation. We composed whole class junk music exploring different musical elements like dynamics, tempo, texture, duration, pitch and structure. We then worked in groups to compose our own junk music using the skills we had been taught. We had a lot of fun with the junk percussion. Year 3 group junk music exploring different musical elements like dynamics, tempo, texture, pulse, rhythm and structure. We tried hard to keep the rhythms in time with each other. We have also enjoyed listening to music inspired by nature and discussing it in terms of the musical elements like texture, tempo, pitch and dynamics. After discussing different pieces of music and how they made us feel, we composed our own piece of music inspired by a walk along a river. We wanted our music to be calm so our tempo was slow. We used different instruments and we brought them in one at a time. As more instruments played the texture got richer and the dynamics got louder. We then brought the instruments out one at a time and the dynamics got quieter again. We played a drone on the notes C and G and the tune was played on the C pentatonic scale. We composed a class composition first and then worked in groups. We felt very relaxed when performing these compositions. We learned a song about a volcano and we sang it as a round. We learned about 4 beat rhythm patterns and composed our own accompaniment to the song. We also included a drone on tuned percussion. In groups we created a performance by putting the instrumental and vocal parts together using an ABA structure. We also watched a clip called I Lava You. We discussed the way the music tells a story and how the composer uses the musical elements – structure, texture, pitch, tempo and timbre. In groups we composed our own version of the story through music. We enjoyed performing and evaluating our compositions. 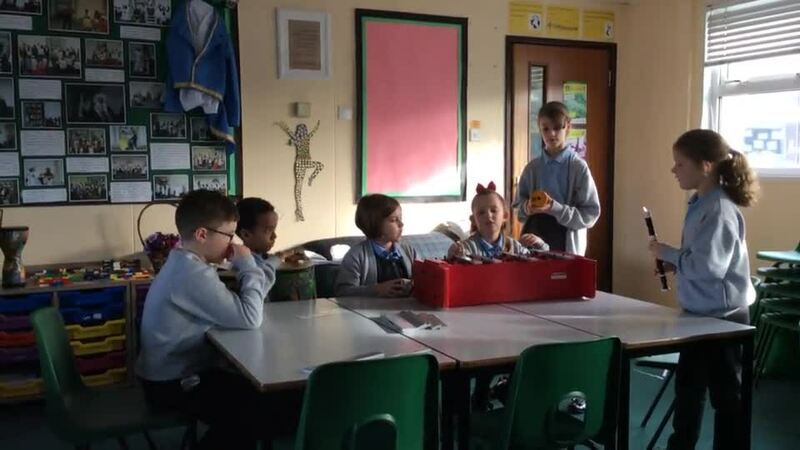 Year 4 - a group performance inspired by a volcano song. We put the instrumental and vocal parts together using an ABA structure. We used our understanding of the musical elements - structure, texture, rhythm and pitch. We sang in unison and as a round in our performance. We learned two different songs about the Vikings and we learned about pulse and rhythm. We learned that the pulse can be organised differently. One song was organised in 3 and the other in 4. We found out more about the Vikings and wrote our own lyrics to both of the songs. We also composed our own pieces of music to accompany the songs. We used different rhythms and thought about texture, tempo, dynamics and structure. One of our songs had to have 3 beat rhythm patterns and the other 4 beat rhythm patterns. Year 4 group performance. 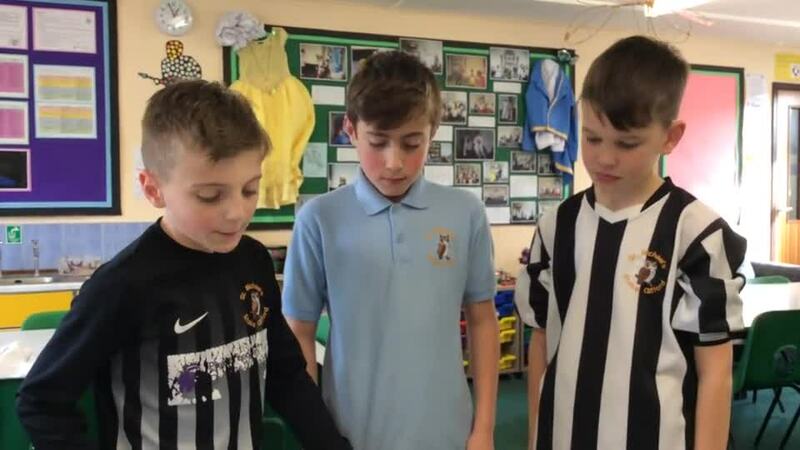 We wrote our own lyrics and created a performance of the song using vocals and instruments. We used different rhythms and thought about structure, texture, tempo and dynamics. We even had a go at singing in parts. 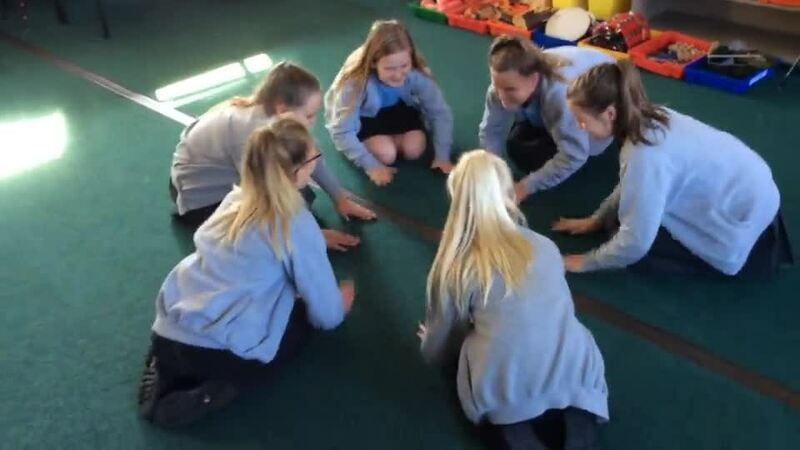 We learned songs from the Horrible Histories and evaluated them in terms of the musical elements – pitch, tempo, dynamics, texture, structure, beat and rhythm. We developed our understanding of pulse and rhythm. We practised reading rhythms from notation. We learned about crotchets, quavers, minims and semibreves. In groups of 3, we composed our own rhythmic accompaniments to the songs. We practised each part separately and then put the parts together. We performed to the class and evaluated these performances. 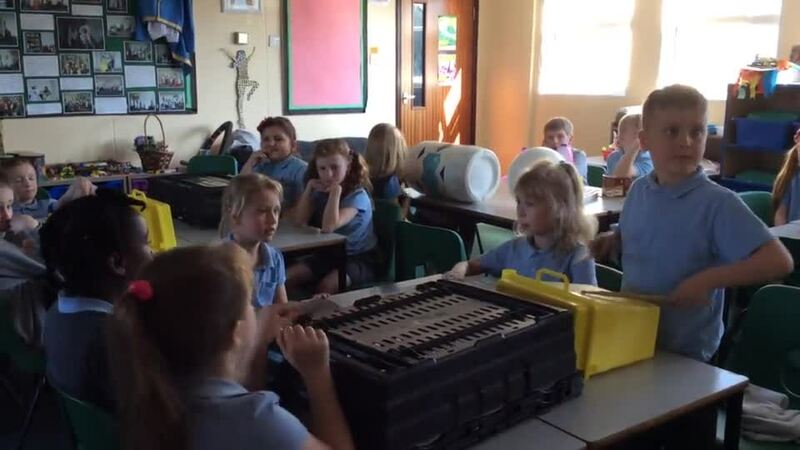 We also learned about timbre and how instruments can be grouped according to their timbre. We took rhythms from the lyrics of one of the songs and organised the instruments according to their timbre. We composed a class rhythmic piece. It sounded really good because all of the rhythms fitted together really well. We learned songs inspired by our Space Topic. Our main focus was listening and responding to Gustav Holst’s Planet Suite. We listened to and evaluated each movement using musical vocabulary. We compared the different movements focusing on the musical elements. We discussed the images and colours that came to mind when we listened to the music and how the different movements made us feel. We then responded to our favourite movement through art. We also composed 2 contrasting pieces of music inspired by Venus and Mars and arranged them into an A B A structure. Here are some of our artistic responses. Can you tell from the images, patterns and colours which planets they represent? We learned a song about the Mayans and sang it in several parts. We sang different phrases of the song to create melodic ostinati. In groups we composed accompaniments using melodic and rhythmic ostinati. We also used a drone on tuned percussion. It sounded really good. We performed and evaluated our compositions. We also learned about Mayan music and the sorts of instruments they might have played. We composed our own Mayan inspired music using our understanding of lots of different musical elements - structure, texture, pulse, rhythm, pitch, tempo, dynamics and timbre. We researched Mayan ceremonies and then learned a body percussion piece called Connect It by Anna Meredith, a Scottish composer. We used our understanding of Connect It, to compose our own piece to be performed at a Mayan Ceremony. We used our understanding of all the musical elements with a focus on structure, texture and dynamics. We included vocals, body percussion and movement. This was great fun and we performed our group pieces to the class. We listened to and evaluated A Short Ride in a Fast Machine by John Adams. We discussed it in terms of the musical elements, however focused on his use of pulse, rhythm and repetition and how he used consonance and dissonance to create excitement and tension. In groups we composed our own pieces of music inspired by A Short Ride in a Fast Machine. We performed and evaluated our group compositions. We also learned a vocal Machine Round. We developed our understanding of reading from notation, about time signatures and other musical markings that tell the performer how to play the music - accents, staccato and dynamic markings. In groups we composed our own vocal pieces to represent a machine. We thought about structure, texture, pulse, rhythm, tempo and dynamics. We wrote our pieces down using notation. 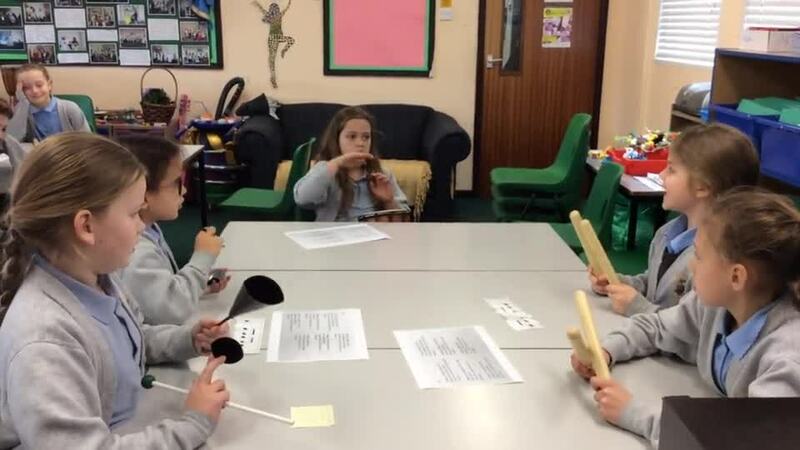 We performed our music vocally and then on percussion instruments. It was great fun and they sounded great.